White can only win this fight via ko: she has too few liberties to win a capturing race. Since this local ko threat is also a mutual ko threat, this illustrates the principle of removing mutual threats before starting a ko. Had it only been a threat for White, she would have done better to play it as her first threat in the actual fight. Had it only been a threat for Black, he would not have had to answer an attempt to remove it, so White would have had to start the ko and he would have been able to use it as his first threat. P.J.Traill: Could it not make sense to make the ko smaller if she expects to lose it, and just wants the profit from Black ignoring her threat? Dave: Good question but be careful of what we mean by the "size" of the ko. 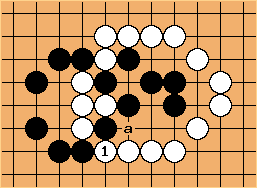 Changing to "a" and forcing Black to play at 1 instead of "a" will take one Black stone out of the ko. This will reduce the cost of losing the ko for Black but will not reduce the cost of losing the ko for White. Therefore playing at 1 is correct.